Video and computer games in their cultural contexts. As the popularity of computer games has exploded over the past decade, both scholars and game industry professionals have recognized the necessity of treating games less as frivolous entertainment and more as artifacts of culture worthy of political, social, economic, rhetorical, and aesthetic analysis. Ken McAllister notes in his introduction to Game Work that, even though games are essentially impractical, they are nevertheless important mediating agents for the broad exercise of socio-political power. In considering how the languages, images, gestures, and sounds of video games influence those who play them, McAllister highlights the ways in which ideology is coded into games. Computer games, he argues, have transformative effects on the consciousness of players, like poetry, fiction, journalism, and film, but the implications of these transformations are not always clear. Games can work to maintain the status quo or celebrate liberation or tolerate enslavement, and they can conjure feelings of hope or despair, assent or dissent, clarity or confusion. Overall, by making and managing meanings, computer games—and the work they involve and the industry they spring from—are also negotiating power. 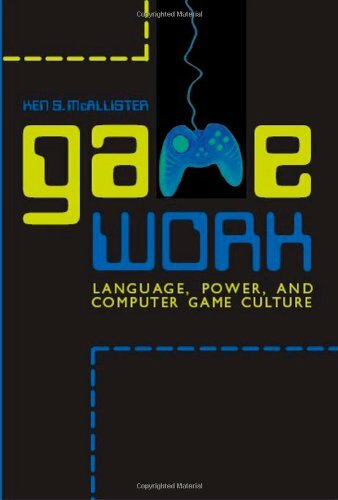 This book sets out a method for "recollecting" some of the diverse and copious influences on computer games and the industry they have spawned. Specifically written for use in computer game theory classes, advanced media studies, and communications courses, Game Work will also be welcome by computer gamers and designers. Ken S. McAllister is Assistant Professor of Rhetoric, Composition, and the Teaching of English at the University of Arizona and Co-Director of the Learning Games Initiative, a research collective that studies, teaches with, and builds computer games.